Considered the greatest, and most storied, rarity in all of Canadian numismatics with only two examples struck in silver. One coin is permanently housed in the National Currency Collection in Ottawa along with a single striking in lead that surfaced in late 70's and second specimen is in private collection. The Dominion of Canada Currency Act of 1910 provided for the striking of a Canadian Silver Dollar in .925 silver with a weight of 360 grains. A coinage press was obtained from England for the purpose of striking Dollar-size coins. The Royal Mint prepared dies and a pair of Specimens were struck in silver, and one in lead. For some reason, Canadian government authorities decided against issuing business strike Silver Dollars at this time. Sir E. Bertram MacKennal designed an obverse that shows George V, in crown and robes, facing left. The initials B.M. appear on the truncation of the bust. The legend is in Latin GEORGIVS V DEI GRA: REX ET IND: IMP: and translates as GEORGE V, BY THE GRACE OF GOD KING AND EMPEROR OF INDIA. The reverse was designed by W.J. Blakemore and taken from a previous design by the noted British coin and medal designer, Leonard C. Wyon. The reverse design has a crown at 12 o'clock, above a maple wreath which surrounds the legend ONE DOLLAR CANADA 1911. 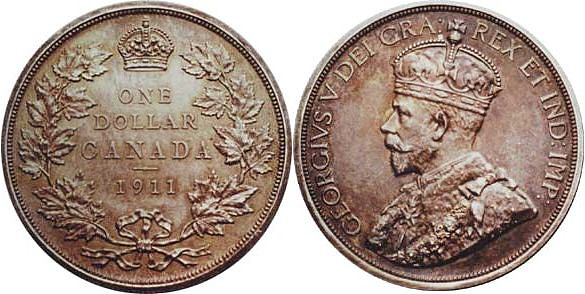 The obverse of the first Canadian silver dollar struck for circulation was used to commemorate the 25th Anniversary of the accession of George V: his Silver Jubilee. His Majesty’s portrait was work of Percy Metcalfe, artist and sculptor. This design has been introduced a few years earlier on other Commonwealth coinage (Fiji, Southern Rhodesia, Australia, New Zealand). The reverse was a very modern design for its time and was a work of eminent Canadian sculptor Emanuel Hahn. His initials EH appear in the water below the left end of canoe. Explorers and trappers with native aboriginal guides helped shape the country’s beginning and few designs have been better able to depict the scene than the “Voyageur”. The design shows a voyageur (travelling agent for a fur trade company) and native aboriginal paddling a canoe with an islet bearing two wind-swept trees in the background. The Northern Lights (Aurora Borealis) are in the background. The canoe also carries several bundles of fur. On the front bundle are the incuse initials HB. This signifies Hudson’s Bay Company, which played major role in Canada’s early history. 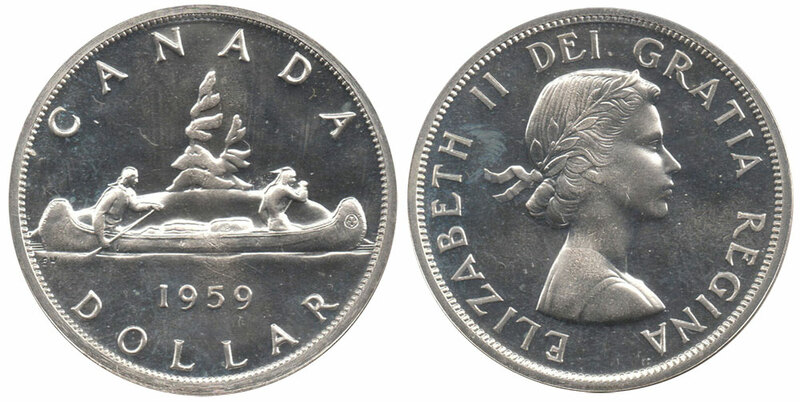 Since 1935, the “Voyageur” design has been used to form the regular, non-commemorative, reverse on Canada’s silver dollars and later on, beginning in 1968 on nickel dollars. The year 1939 saw Canada's second commemorative dollar. This time the reverse was used as commemorative device for the Royal visit of King George VI and Queen Elizabeth to Canada in May and June of 1939. The design shows the Centre Block and the Peace Tower, the main building of the Canadian parliamentary complex on Parliament Hill, in Ottawa, Ontario. The Latin phrase on the reverse, "FIDE SVORVM REGNAT" is translated, "He reigns by the faith of his people". Although Hahn's initials EH flanked the building on the original model, they were removed by government direction and never appeared on the coins. The obverse remained unchanged from the previous years issues of king George VI. The production of silver dollar coins was suspended during the World War II, there are no dollars issued from 1940 to 1944. Silver dollar production resumed in 1945 with the smallest mintage up to that time: only 38,390 pieces were struck. Silver dollars from 1945 are very hard to get in high flawless grade in which they command good premium. The obverse and reverse design for 1946 silver dollar remained unchanged from the previous year. The obverse design for 1948 silver dollar changed from the previous year to offset the change of official title of George VI as Emperor of India. Following India's independence in 1947 King George VI ceased being its Emperor and his title on the coins had to be changed accordingly. 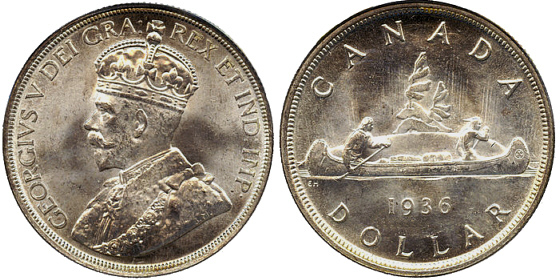 For Canadian coinage, the deletion of "ET IND: IMP:" (AND EMPEROR OF INDIA) from the obverse legend was to occur in 1948. Reverse design remained unchanged. The 1949 issue is considered by many to be the most beautiful of all Canadian silver dollars.It was issued as the third commemorative in the silver dollars series and was issued to mark the entry of Newfoundland into the Confederation. The reverse shows "Matthew", the ship in which John Cabot is thought to have discovered the island in 1497. 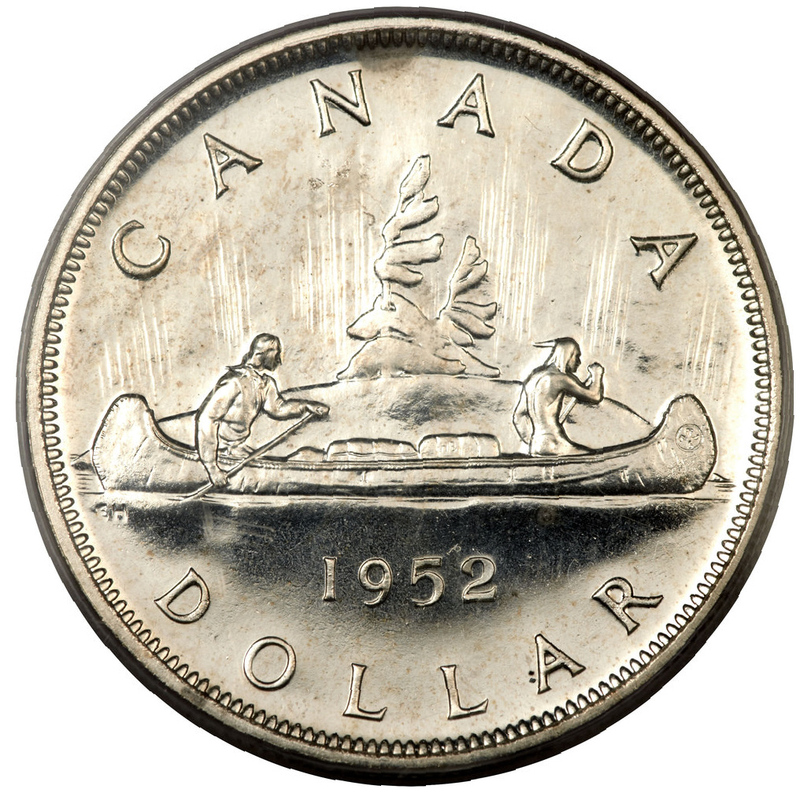 1950 saw a return of standard Voyageur design reverse. Design for 1951 was standard Voyageur design reverse. Design for 1952 was standard Voyageur design reverse. Design for 1953 was standard Voyageur design reverse. Design for 1954 was standard Voyageur design reverse. Design for 1955 was standard Voyageur design reverse. Design for 1956 was standard Voyageur design reverse. Design for 1957 was standard Voyageur design reverse. In commemoration of the gold rush centenary and the establishment of British Columbia as a British Crown colony, a special reverse design was employed for year 1958. The reverse design depicts a Native American totem pole with the mountains of British Columbia in the background. Because the totem pole contained an element which signified death the 1958 British Columbia dollar proved unpopular with the Coastal Natives. Design for 1959 was standard Voyageur design reverse. Design and specification for silver dollars issued from 1960 - 1963 remained unchanged with standard Voyageur design reverse. 1964 represented the 100th Anniversary of the historic meetings in Charlottetown and Quebec City in 1864 that began the process of moving from individual colonies to a single confederation. The reverse, designed by Dinko Vodanovic and Thomas Shingles, prominently features a circle with a the French fleur-de-lis, Irish shamrock, Scottish thistle, and English rose all conjoined with “CHARLOTTETOWN” and “QUEBEC” outside of the circle. Flanking the circle design are the designer's initials, D.V. to the left and T.S. to the right. On the outer periphery are the words “CANADA”, “DOLLAR”, and the dual date “1864 1964”. Design for 1965 was standard Voyageur design reverse, but with the new portrait of the Queen Elizabeth II. Design for 1966 was standard Voyageur design reverse. To mark the 100th anniversary of the Confederation it was decided that all denominations for 1967 would bear commemorative reverses. Circulating coins designed by famous Canadian artist Alex Colville were issued depicting various animals common to Canada, with a flying Canada goose on these silver dollar coins.